The Future Faculty Career Exploration Program welcomes diverse prospective faculty to explore teaching and post-doctoral opportunities at RIT. When colleges and universities seek to recruit new faculty, search committees sometimes struggle to include diverse applicants in the candidate pool. Rochester Institute of Technology’s Future Faculty and Career Exploration Program (FFCEP) aims to address this issue. The program will welcome 17 diverse prospective faculty to campus Oct. 2–4 to explore teaching and post-doctoral opportunities at the university. The program focuses on recruiting prospective candidates from those nearing the completion of their Master of Fine Arts, doctoral study or post-doctoral assignments. Throughout the three-day event, candidates present their scholarly work and meet with deans, faculty and students. Attendees practice interviewing techniques and receive feedback on scholarly work in formal and informal settings. The event also includes presentations and discussions about the university’s research and career development initiatives as well as tours of RIT’s colleges and laboratory facilities. More than 300 prospective faculty have participated in the annual program since 2003. 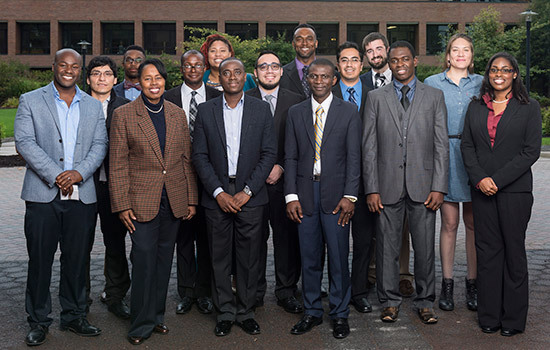 Approximately 19 percent of the AALANA (African American, Latino American and Native American) faculty hires at the university—18 total thus far with 12 being tenure-track positions—have come through the Future Faculty program, aligning with RIT’s strategic plan and its diversity goals. Current RIT faculty who participated in the program in previous years hold positions across the university with the Kate Gleason College of Engineering, National Technical Institute for the Deaf, College of Imaging Arts and Sciences and more. This fall, RIT was recognized with several noteworthy awards for its commitment to diversity. For the fourth year in a row, RIT received a Higher Education Excellence in Diversity (HEED) Award from INSIGHT into Diversity magazine, which honors colleges and universities that show an outstanding commitment to diversity and inclusion across their campuses. RIT was also honored as an institution committed to diversity for 2017 by Minority Access, Incorporated.